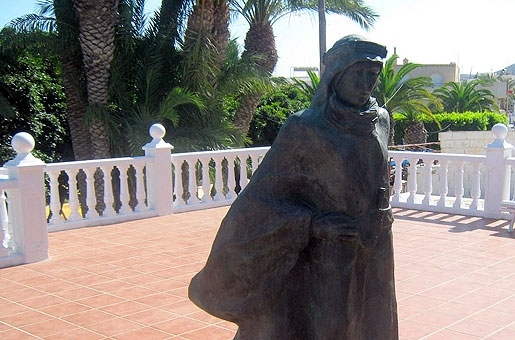 CARBONERAS has paid homage to Lawrence of Arabia with the unveiling of a statue in the town hall square close to the castle. After a visit of Omar Sharif to the town last year to mark the 50th Anniversary of the filming, the mayor of Carboneras vowed to pay tribute to the film that did so much for the town. Speaking at the unveiling ceremony, the mayor thanked the sculptress Carmen Mudarra for making it possible and said that Carboneras would feature in photos from all over the world as tourists came to have their photo taken with the statue. He also thanked Beatriz Perez Aranda, a journalist for Spanish Channel TVE, and Juan Antonio Gomez Angulo, both of whom have great knowledge and expertise in the world of cinema for accepting the invitation to attend the ceremony. Filming of Lawrence of Arabia took place in Carboneras between February and June 1962. It was directed by David Lean and included an all star cast of movie greats such as Peter O’Toole, Omar Sharif, Alec Guinness and Anthony Quinn. The film went on to win seven Oscars in 1963.